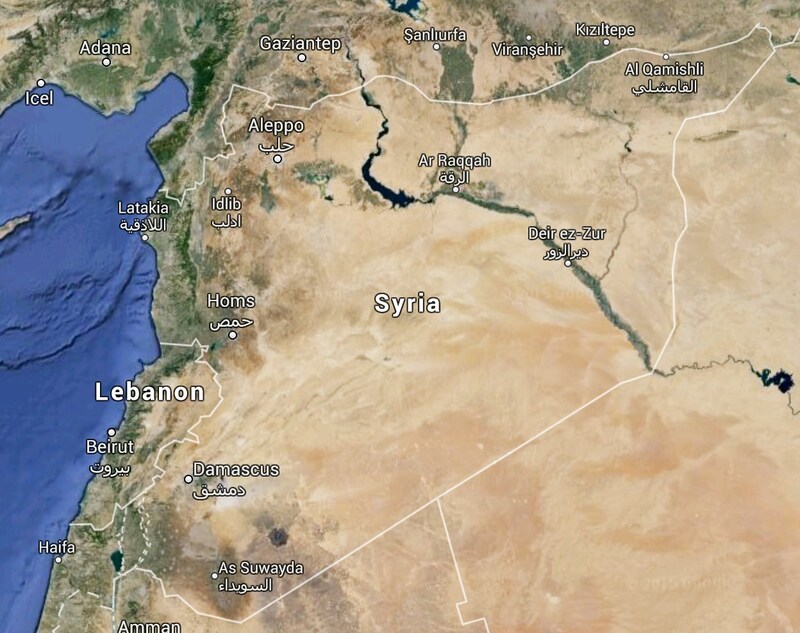 The Middle Eastern country of Syria has been in a state of civil war since 2011. One factor influencing the current situation is climate change. Climate change is responsible for desertification in the region, which is leading to increased dissent among the citizens of Syria. Since March of 2011, a small Middle Eastern country named Syria (Figure 2) has been combating an uprising that has been a central focus of international news to this day. The people are rebelling because they are upset with the regime of Bashar al-Assad, the president of Syria (Figure 1). More than seventy-five thousand people have been killed since the inception of the uprising. Casualties have come from citizens either defending the country, or rebelling against it. To understand the frustrations of the Syrian people, one needs to look to the root cause of the uprising. Figure 1. 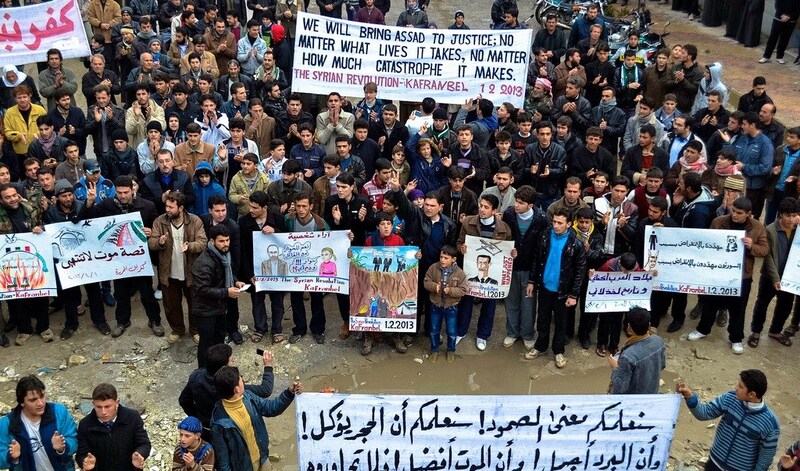 Demonstration in Kafranbel, Idlib against the Assad Regime. Photograph by Freedom House, 2013. CC BY 2.0. There are many reasons for the conflict in Syria. First, the people were upset that the Assad regime refused to yield any of its power and hold a democratic election. Second, the Assad regime was arresting large sums of people for protesting against its rule, including school children. The third and often overlooked reason for the conflict is that climate change has caused large losses for the Syrian agricultural industry, and the government was unwilling to help. Climate change is occurring in Syria by means of depleting water supply and advancing desertification, both of which are closely linked. These effects of climate change are expected to continue through 2050. Figure 2. Syria is located in the East Mediterranean within the Middle East. Its capital, Damascus, is located in the southwest near the Lebanon boarder. Figure 3. Comparison of rainfall in Syria to the normal season average (%). Courtesy of the USDA Foreign Agricultural Service, 2008. Public Domain. Figure 4. The desert in Syria is expanding due to desertification and the lack of precipitation. Photograph by Marc Veraart, 2010. CC BY-ND 2.0. Climate change has led to the increasing number of rebels in Syria. The Syrian crisis is an issue that must be addressed through international systems, as the effects of climate change are likely to increase. Analysts are in agreement that the current effects of climate change in the Middle East are alarming. Nine of the world’s top importers of grain are located in North Africa and the Middle East, and expanding desertification will make growing crops increasingly more difficult.10 The uprising in Syria may be first of many conflicts to arise in the Middle East as a result of climate change. Plumer, B. (2013 September 10). Drought helped cause Syria’s war. Will climate change bring more like it? The Washington Post, Webpage. Freedom House. (2013). Demonstration against ASSad regime in Kafranbel, Idlib. [Photograph]. Retrieved from FlickrCommons. CC BY 2.0. USDA Foreign Agricultural Service. (2008). 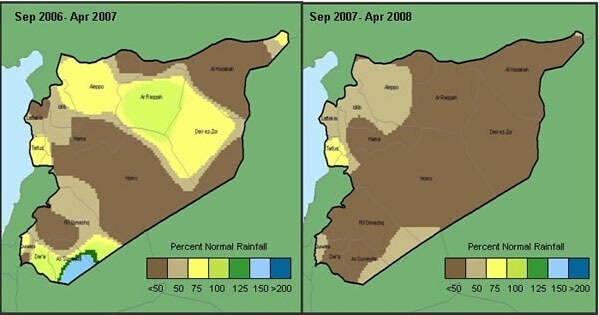 [Diagram of seasonal rainfall in Syria during the 06-07 and 07-08 planting seasons]. Retrieved from http://www.pecad.fas.usda.gov/highlights/2008/05/syria_may2008.htm. Public Domain. Veraart, Marc. (2010). [Photograph of man on a motorcycle in the Syrian desert]. Retrieved from FlickrCommons. CC BY-ND 2.0. Next: 1.4 Hawaii Votes – Yes or No to G.M.O.s?